Los Angeles overcomes a 10-point deficit to beat Green Bay, 29-27. 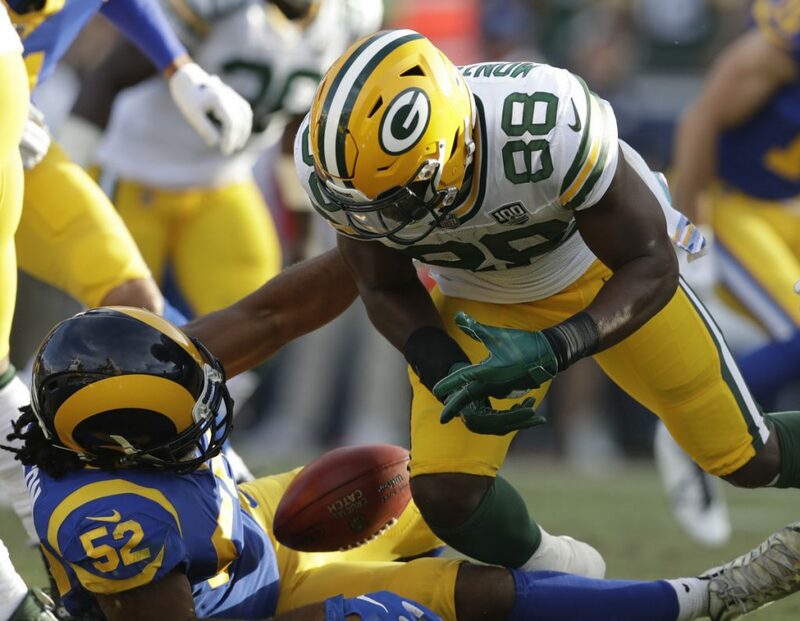 LOS ANGELES — Greg Zuerlein hit a 34-yard field goal with 2:05 left and Ramik Wilson forced and recovered Ty Montgomery’s fumble on the ensuing kickoff return, allowing the Los Angeles Rams to remain unbeaten without a late defensive stand in a 29-27 victory over the Green Bay Packers on Sunday. Both teams rallied from 10-point deficits to take a lead in front of a bipartisan Coliseum crowd, but Rodgers never got the chance to mount a winning drive. Instead, the Rams extended their best start to a season since 1969 with another key play from their superlative special teams. Josh Reynolds caught two touchdown passes for Los Angeles, while Todd Gurley rushed for 114 yards and scored a touchdown in his franchise record-tying 11th consecutive game on a 30-yard pass in the third quarter. SAINTS 30, VIKINGS 20: Drew Brees and the Saints (6-1) paid back Minnesota (4-3-1) for a last-second loss in the playoffs last season, using two key turnovers, including a 45-yard interception return by P.J. Williams, to fuel a victory in Minneapolis. EAGLES 24, JAGUARS 18: Carson Wentz threw touchdown passes to Dallas Goedert, Wendell Smallwood and Zach Ertz, and Philadelphia (4-4) held on for a win over Jacksonville (3-5) in London. Blake Bortles, restored as Jacksonville’s starting quarterback despite being pulled in a loss to the Houston Texans a week earlier, completed 24 of 41 passes for 286 yards as the Jaguars lost their fourth consecutive game. CARDINALS 18, 49ERS 15: Josh Rosen threw a 9-yard touchdown pass to fellow rookie Christian Kirk with 34 seconds to play, and Arizona (2-6) beat visiting San Francisco (1-7) for the eighth straight time and second time in three weeks. Arizona got two fourth-quarter touchdown passes from Rosen after the 49ers built a 15-3 lead. COLTS 42, RAIDERS 28: Andrew Luck threw his third touchdown pass of the game to break a tie with 5:28 to go, and visiting Indianapolis (3-5) won in consecutive weeks for the first time in three years. Luck connected for TDs with all three of his tight ends, with the 10-yard pass to Jack Doyle putting the Colts up 35-28. Derek Carr threw three TD passes and ran for a fourth for Oakland (1-6). PANTHERS 36, RAVENS 21: Cam Newton torched the league’s No. 1-ranked defense, completing 21 of 29 passes for 219 yards and two touchdowns and running for 52 yards and another score as Carolina (5-2) beat Baltimore (4-4) for its ninth straight home win. STEELERS 33, BROWNS 18: Ben Roethlisberger threw two touchdown passes to Antonio Brown, and James Conner scored twice to bring some solace to a city grieving from tragedy. The Steelers (4-2-1) overcame a slow start and their own mistakes to win their 15th straight at Heinz Field over the Browns (2-5-1), who have lost 25 consecutive road games – one shy of the NFL record. CHIEFS 30, BRONCOS 23: Patrick Mahomes threw for 303 yards and four touchdowns – including two to Sammy Watkins – and Kansas City (7-1) beat visiting Denver (3-5). Travis Kelce and Kareem Hunt also had touchdown catches for the Chiefs, who have won 19 of their last 21 games against AFC West rivals. Kansas City has a seven-game winning streak against the Broncos. WASHINGTON 20, GIANTS 13: Safety D.J. Swearinger intercepted two passes, Matt Ioannidis had two sacks, and the NFC East leaders rode their defense to a third straight win, at East Rutherford, New Jersey. Washington sacked Eli Manning seven times in sending New York (1-7) to its fifth straight loss. BENGALS 37, BUCCANEERS 34: Jessie Bates returned Jameis Winston’s fourth interception for a touchdown, and Randy Bullock kicked a 44-yard field goal on the final play as Cincinnati (5-3) won at home. Ryan Fitzpatrick relieved Winston and rallied the Buccaneers (3-4) to a 34-34 tie with a pair of touchdown passes, including an 18-yard toss with 1:05 left. SEAHAWKS 28, LIONS 14: Russell Wilson threw three touchdown passes in the second quarter to lead Seattle (4-3) to a win at Detroit (3-4). Wilson’s 24-yard pass to Tyler Lockett, 15-yard throw to David Moore and 12-yard pass to Ed Dickson gave Seattle a 21-7 lead at halftime. BEARS 24, JETS 10: Mitchell Trubisky threw for two touchdowns for the short-handed Bears (4-3) in a win at home against the Jets (3-5). The Bears played without star pass rusher Khalil Mack (right ankle) and No. 1 receiver Allen Robinson (groin), but held the Jets to 207 yards. Trubisky was shaky but did enough to help the Bears come out on top. He connected with Tarik Cohen for a 70-yard touchdown on a screen pass in the first quarter and threw a 4-yard scoring pass to Anthony Miller in the third, making it 14-3. He was 16 of 29 for 220 yards, and also ran for 51 yards on six attempts.